What is Help One Classroom? 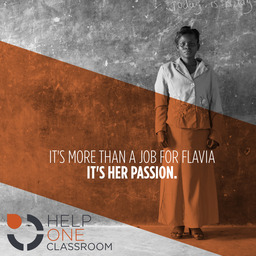 Help One Classroom is an ongoing campaign to invest in the education of children in Haiti & Uganda. Education transforms communities & breaks the cycle of extreme poverty. And it all starts with Teachers. A good teacher makes a world of difference, so we are raising funds for teacher salaries, training and supplies. By ensuring that the teachers can provide for themselves and their families, and equipping them with necessary supplies and training, we enhance the education our students receive…we bring opportunity & hope to entire communities. Because, the future of every country, city and community lies in the children. In fact, education may be the most effective way to make a LASTING IMPACT, as communities transform from within! We need to raise $75,000 to support 30 classrooms for the 2014-2015 school year. This support includes teacher SALARIES, teacher TRAINING and classroom SUPPLIES. $2,500 provides all necessities for ONE classroom for ONE year!